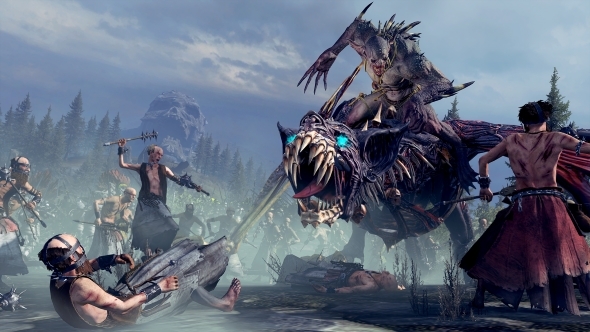 Total War: Warhammer 2 is happening, if you haven’t heard. As part of that, Creative Assembly are redoubling their efforts to create unique factions that feel like an entirely different style of game, rather than simply a new flavour to the same world-conquering. However, that leaves the first game’s four races seeming a little out-dated. Given it’s designed to eventually allow you to play all three games together, they need to be up to code. Thankfully, it looks like CA have a plan. For more on Total War: Warhammer 2, we have everything you could possibly want to know all wrapped up. The races of Warhammer 2 are promised to play extremely different from one-another, and presumably CA would like that to be true across the entire, eventual Warhammer world. In fact, explains communications manager Al Bickham, in a way they’ve already started. “We’ve done a little bit of that already. We tweaked [legendary lord] Balthasar Gelt a bit recently as well. “The two [recently added] legendary lords are essentially their own Vampire Counts subfaction. So the beauty of doing lots of free content drops and paid DLC content as well is it constantly gives us a bit of extra time to go back and tweak things. When we do a new content update there’s always some new patch notes with it because the battle team is always sitting there rebalancing stuff for multiplayer furiously.